I just love rainbows! Do you? There’s bright, colorful, and make any day better. So, let’s make a few rainbows, shall we? I’ve found the ultimate list of rainbow crafts for kids that I know you’ll love. Grab your craft supplies and pick out a few fun crafts to make! There’s so many ideas. How can you choose? Do you want a craft for toddlers, preschoolers, or big kids? I’ve got you covered for all age levels! Do you want a paper plate craft, a mobile, or a simple sewing project? You’ll find them here… plus more great ideas. Use an egg carton to make our pretty recycled Egg Carton Rainbow craft. Try needle felting to make a pretty Felted Rainbow from Rainy Day Mum. Recycle newspaper to make this Rainbow Circle Bunting from Kitchen Counter Chronicles. Mark your place with a cute Rainbow Corner Bookmark from Red Ted Art. Practice paper weaving with this Rainbow Paper Weaving Craft from What Can You Do With Paper and Glue. Try some simple sewing on a paper plate to make this Rainbow Yarn Art from I Heart Crafty Things. Make a beautiful Rainbow Suncatcher out of fused beads like this craft from Fireflies and Mud Pies. 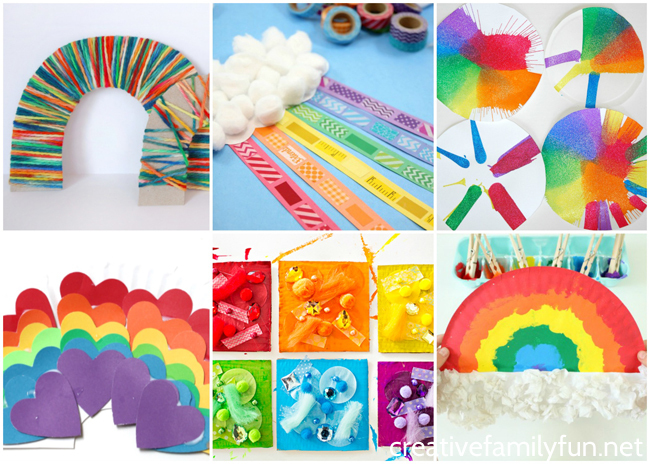 Create a simple Craft Stick Rainbow like this from Easy Peasy and Fun. Make a gorgeous Hand Print Rainbow like this one from Kids Craft Room. Keep your hands clean with this No-Mess Rainbow Art project from Messy Little Monster. Make a pretty 3-D Rainbow with this simple paper craft from Easy Peasy and Fun. Use felt to make a pretty Rainbow Brooch with this simple sewing project from Kitchen Counter Chronicles. 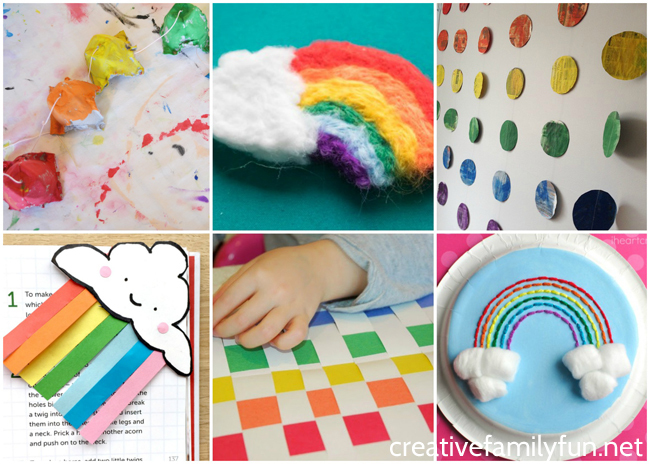 Make an easy Paper Plate Rainbow Craft for toddlers like this fun idea from Arty Crafty Kids. Play some music with this awesome Rainbow Paper Plate Tambourine from Kids Craft Room. Recycle a cardboard tube into this fun Rainbow Blower from Kids Craft Room. Try some salt painting to create this gorgeous Black Glue and Salt Watercolor Rainbow from Mess for Less. Paint with cotton balls to make this super-cute Rainbow Painting from Kids Craft Room. 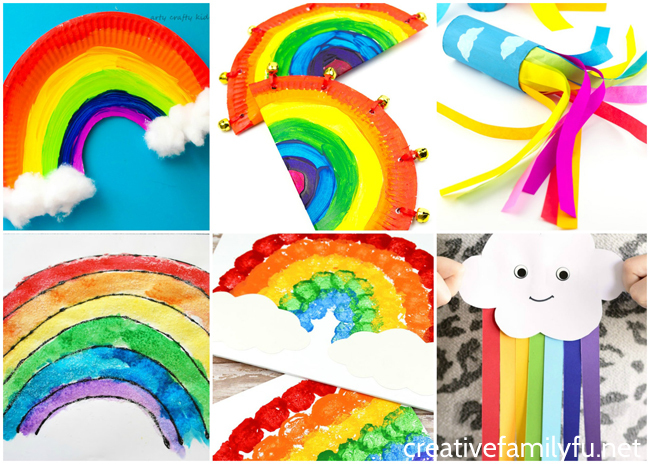 Use paper strips to make this cute Paper Rainbow craft from Easy Peasy and Fun. Use a couple of paper plates to make an adorable Rainbow Paper Plate Bag from Arty Crafty Kids. Cut up straws to make this Rainbow Necklace craft from Planning Playtime. Collect colorful buttons to make this beautiful Rainbow Button Collage Canvas Art from Preschool Inspirations. Use the rain to help you create this Rainbow Rainy Day art from Rhythms of Play. 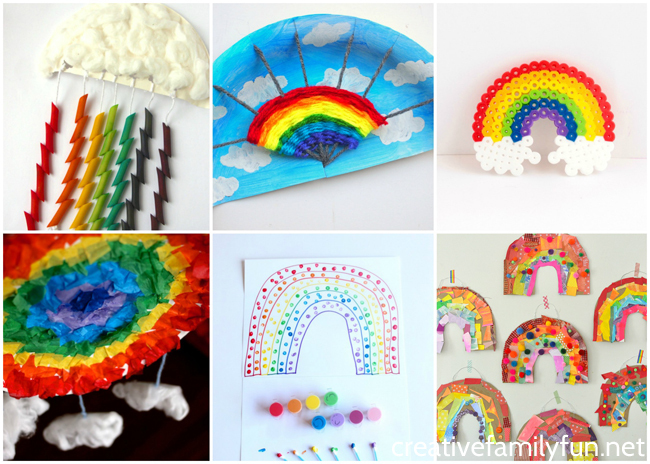 Use straw blowing to make beautiful Rainbow Art like this from Arty Crafty Kids. Clean out your old craft supplies to make this pretty Rainbow Mandala Collage craft from Finding the Golden Gleam. 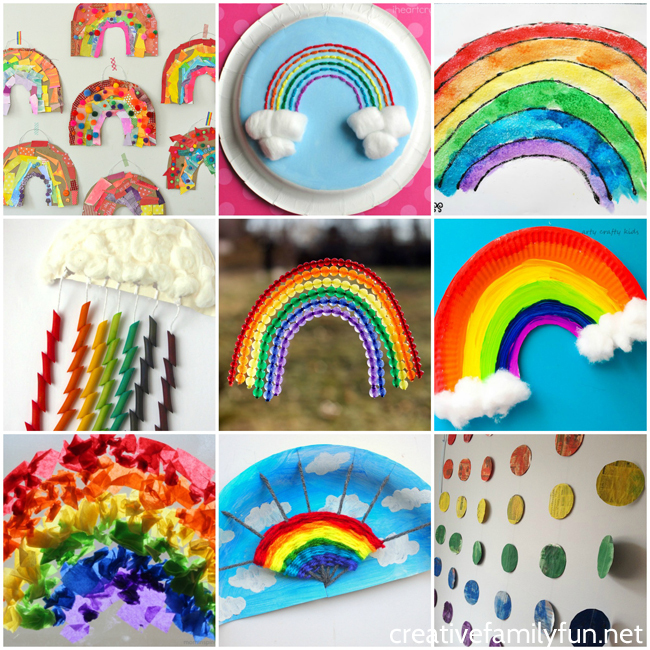 Cut and glue to make this simple Paper Plate Rainbow from The Resourceful Mama. Sort your colorful Cheerios to make this adorable Cheerio Rainbow Craft from Hands On As We Grow. Add some color to your windows with this pretty Tissue Paper Rainbow Suncatcher from Fun Learning for Kids. 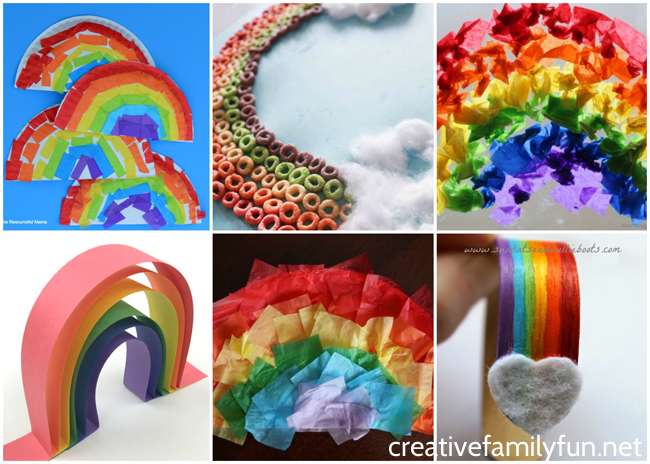 Use construction paper to make this cool 3-D Rainbow Art from Twitchetts. Practice gluing tissue paper squares to make these adorable Tissue Paper and Paper Plate Rainbows from Happy Hooligans. Find out how to bend a craft stick to make a pretty Rainbow Friendship Bracelet from Sun Hats and Wellie Boots. Use dyed pasta to make this pretty Rainbow Mobile from B-Inspired Mama. Weave a rainbow with this beautiful yarn craft from Pink Stripey Socks. Build a rainbow with perler beads with this fun STEAM project from Schooling a Monkey. Make a pretty Paper Plate Rainbow Mandala like this from Happy Hooligans. Paint with cotton swabs to make this simple Rainbow Art from Frogs Snails and Puppy Dog Tails. Use colorful scraps to make these beautiful Cardboard Rainbow Collages from Art Bar Blog. 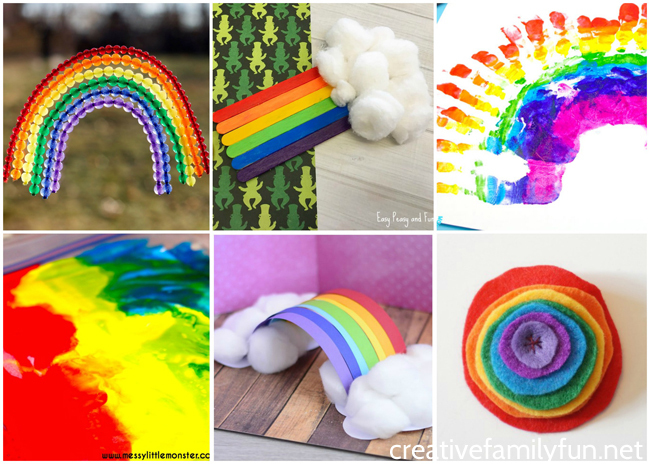 Exercise your fine motor skills with a simple yarn-wrapped Rainbow from What Can We Do With Paper and Glue. Get out your colorful washi tape to make this pretty Rainbow Craft from Housing a Forest. 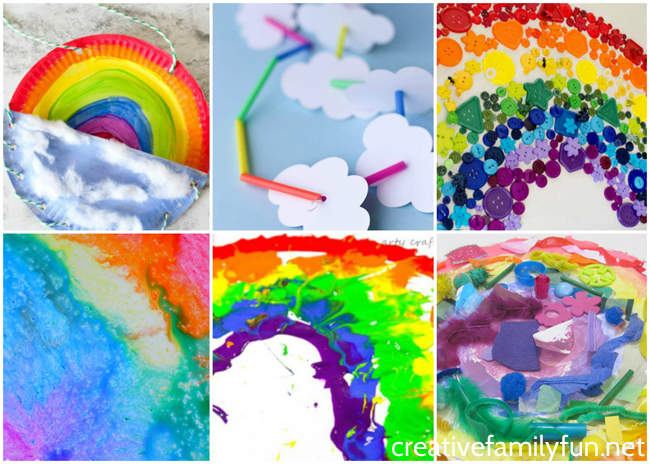 Try spin art to make these pretty rainbows from What Can Do With Paper and Glue. Use colorful hearts to make these pretty Paper Heart Rainbows from No Time for Flashcards. Go on a color hunt and create these pretty Rainbow Cardboard Art Collages from Hello, Wonderful. Paint with pom poms to make a pretty Painted Rainbow Craft from Fantastic Fun and Learning. 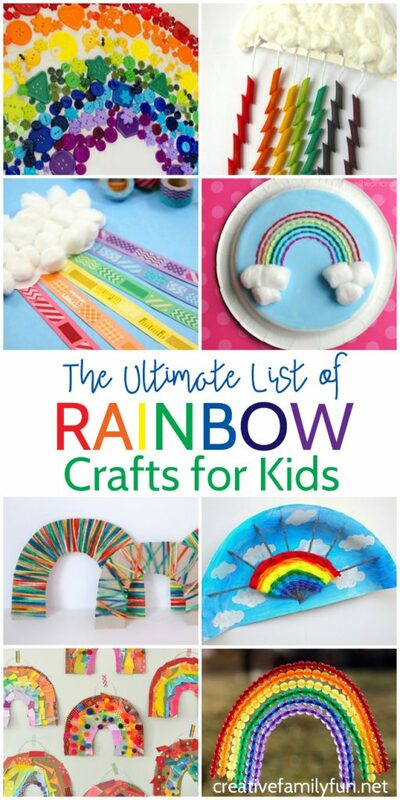 Which of these fun rainbow crafts do you want to make with your kids? 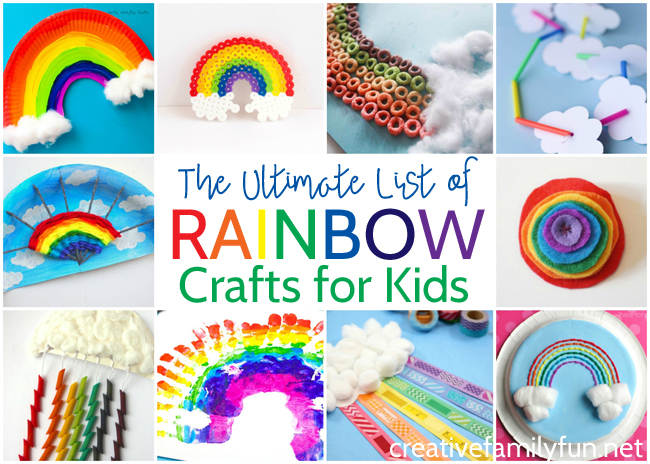 If you enjoyed these rainbow crafts for kids, the above photo is perfect for sharing on Facebook or you can share the photo below on Pinterest.